It's finally Autumn in the South! 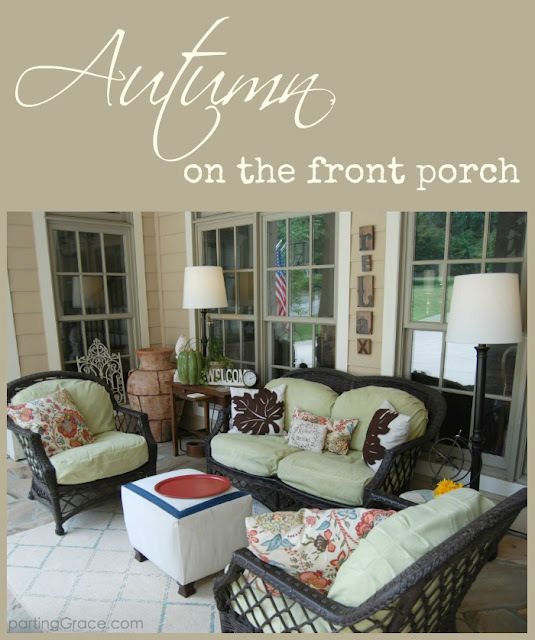 Of all the seasons, Autumn is my favorite, especially for sitting on the front porch. Come have a look at my porch! I know it's very much in vogue to decorate with all neutrals, but I love the colors of Autumn. The area around my front door is bright with mums and gourds and pumpkins. I added a demijohn and a pottery jug, both from Pottery Barn. 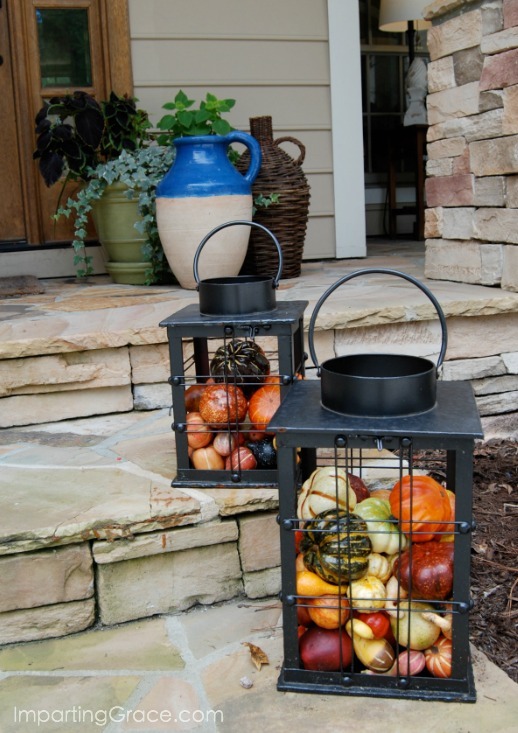 I purchased these large lanterns at Hobby Lobby a couple of years ago, and I change them up to suit the seasons. Right now they're wearing a coat of oil-rubbed bronze spray paint and they're filled with ornamental gourds. The wreath on my front door was handmade by a friend who brought it to me as a hostess gift. She embellished a grapevine wreath with beautiful ribbon and faux botanicals. 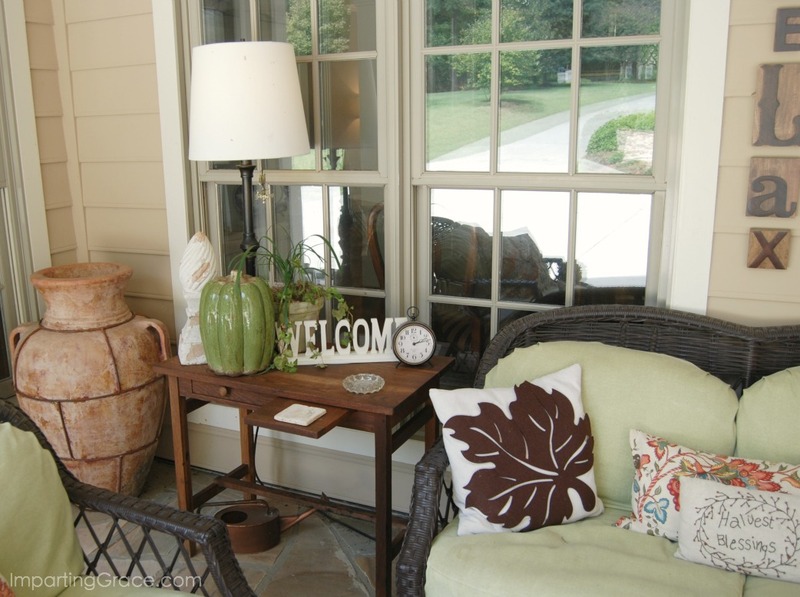 To the right of the front door is one of my favorite parts of our house: the front porch sitting area. This little area is pretty well protected from the elements, so I've created an outdoor living room. 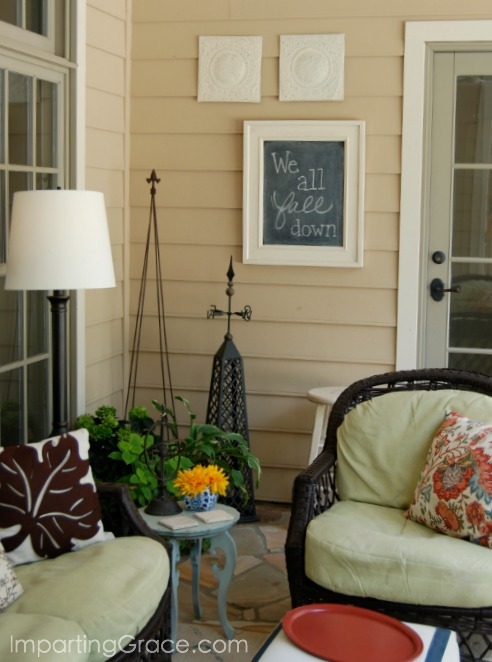 I updated the porch this spring, and to "fallify" things I simply made a few changes. I made quick covers for the throw pillows out of an old Pottery Barn tablecloth. I've always liked the Jacobean print, and the colors are autumnal. I also brought out my DIY Autumn Leaf pillows. The lamp table is actually an antique desk to which I regularly apply Howard's Feed 'n' Wax. The pull-out writing surface is perfect for holding a coaster. I found the large green pumpkin at HomeGoods, and the little clock is part of the Better Homes & Gardens line at Wal-Mart. The "relax" letters are part of the Letterpress line from DaySpring. Wish you could all come sit a spell with me! Just beautiful! Blessings and Happy Fall! Beautiful, and what a nice hostess gift! 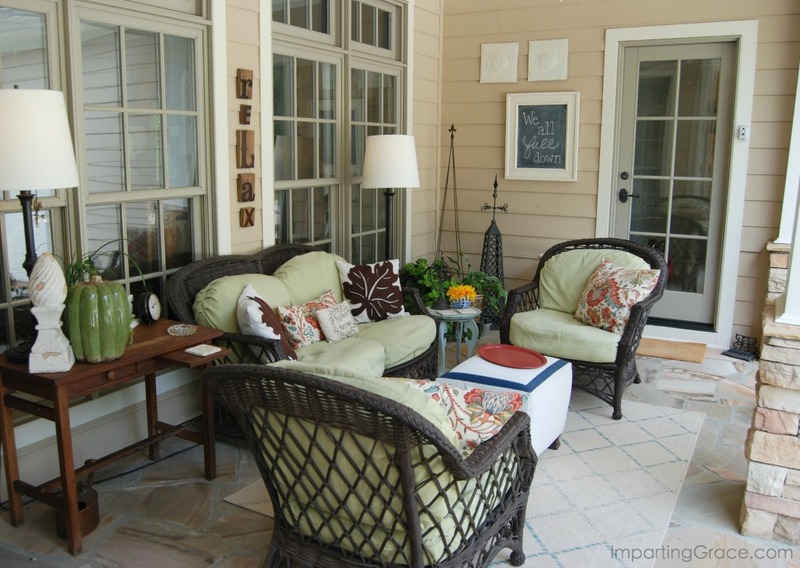 Your front porch is my favorite ever! What I would give for an area like thar. 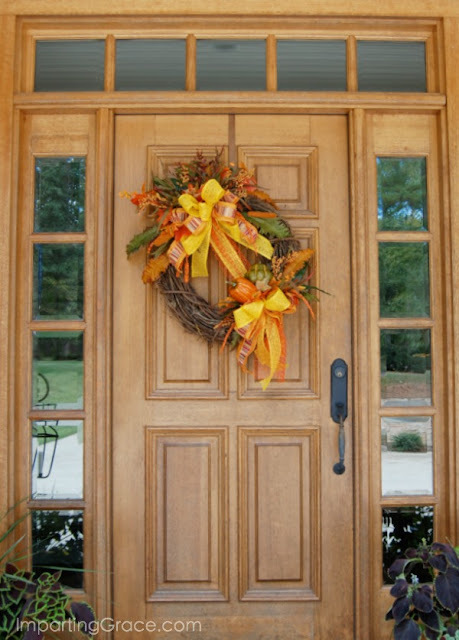 You have dressed it up BEAUTIFULLY for Fall! I now have a patio but it is totally exposed so I have to store the cushions and pillows whenever it rains. It has been raining now for 2 straight days non stop, but we desperately need it so it's OK. I always love seeing your home decked out for the holidays. You have great taste. Everything looks lovely! I love your wide porch! 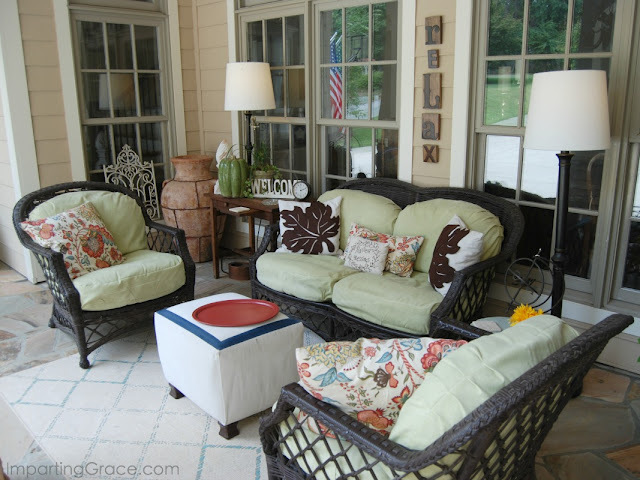 It's cozy and beautifully ready for fall days to just sit and relax with some hot cider! Your home is always inspiring. 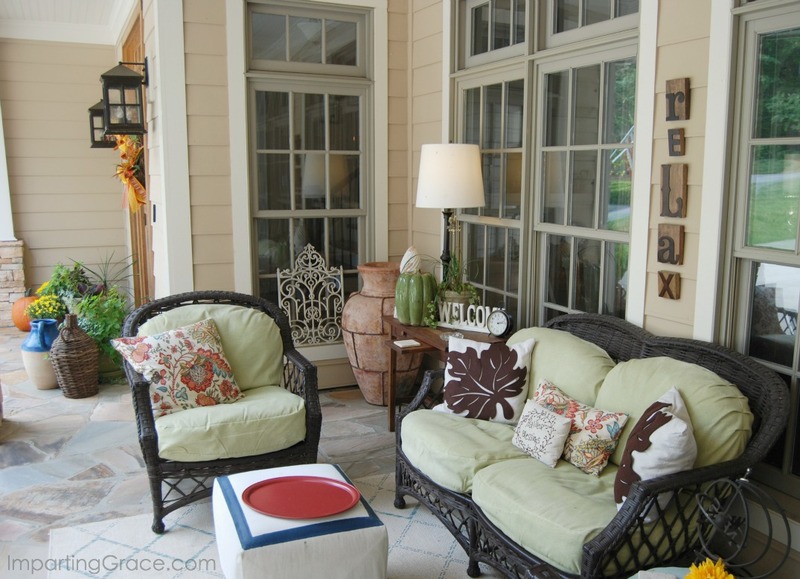 What's better than a front porch?! Yours looks beautiful and so welcoming. And the beautiful thing about Fall is the colors. Have a wonderful weekend, Richella! So beautiful! I love the lanterns especially! You have a beautiful front porch! Who wouldn't love to sit a spell ! Take time to enjoy the little things in life! Happy Autumn from Alberta! 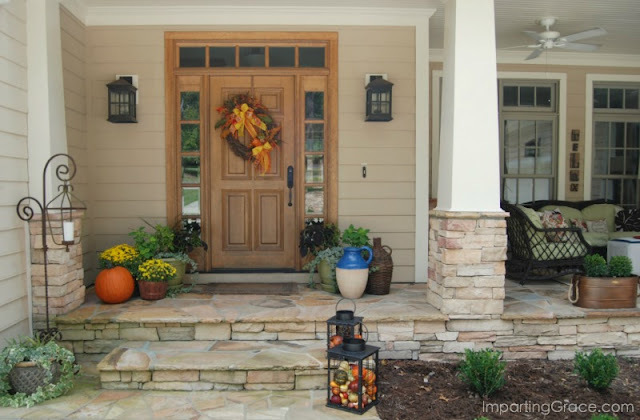 What a beautiful and welcoming front porch and I love how you have decorated it for fall! This is such a perfect and cozy spot to relax and enjoy the outdoors. Loved meeting you last week at Shirley's, hope we can all get together again sometime soon!